With the holiday season upon us, we are feeling festive! Before you start your holiday, here’s a bit about what we’ve been up to lately! We have just release an eBook on Big Data for Telcos and a new webinar about upgrades of OpenStack with running workloads. Meanwhile, we have news about new Charm partners and Juju updates! Read all about what’s new and exciting! This eBook describes what analytics processes telcos should be implementing to most benefit from the tremendous amounts of data available to them. Learn how big data and analytics can mitigate many of the challenges faced by modern telecoms providers. OpenStack Autopilot is part of Landscape, our management tool. Autopilot is the easiest way to build and manage a highly resilient cloud. You can test it with VMware or install it on your hardware. In this webinar, join Billy Olsen, Software Engineer at Canonical, to learn how to upgrade a running Ubuntu OpenStack cloud from Kilo to Liberty with little or no disruption to running workloads. Lots of real-world experience has made this possible, watch how it’s done! The HPC community is exploring OpenStack as a way to accelerate research access to compute, accelerating the pace of innovation, and raising the rate of utilization of rare resources. This session covers the key challenges and the work happening inside the Ubuntu community to address it. 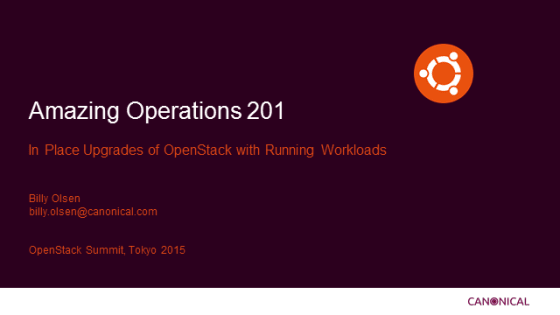 It provides a first-hand account of implementing HPC services in OpenStack with Canonical. Join Marco Ceppi for a short lightning talk that highlights tools that allow you to test your charms and provide a quality “out-of-the-store” experience. Learn the Juju lingo for testing, what it means and why it’s important. And most importantly, discover how to make sure everyone that deploys your charm gets the most “charming” experience possible. The Charm Partner Programme welcomed four new partners: MariaDB, a recognized leader in open source database solutions for SaaS, cloud and on-premises applications; Opencell, a carrier grade open source billing solution; Akanda, the main contributor to the OpenStack project Astara; and WANdisco who will be charming their Fusion Platform, which delivers core functionality supporting continuous availability and performance. The next Ubucon Summit will be taking place in Pasadena, CA, between the 21 – 22 January and hosted at SCALE. Featuring a keynote address by Mark Shuttleworth and talks by community experts. Attending MWC16 in February? We have an exciting cloud presence this year at MWC showcasing SDN, NFV, Big data and OpenStack demos tailored for Telcos and Service Providers. Stop by Booth #3J30 in Hall 3 to see the demos in action and talk to the team. Stay tuned for more information.